According to a new study, drinking more than 2 alcoholic drinks each day in middle-age increases a person’s risk of stroke more than typical risk factors such as high blood pressure and diabetes. Researchers used data gathered between 1967 and 2010 from 11,644 individuals from the Swedish Twin Registry to compare the effects of heavy drinking on risk of stroke. 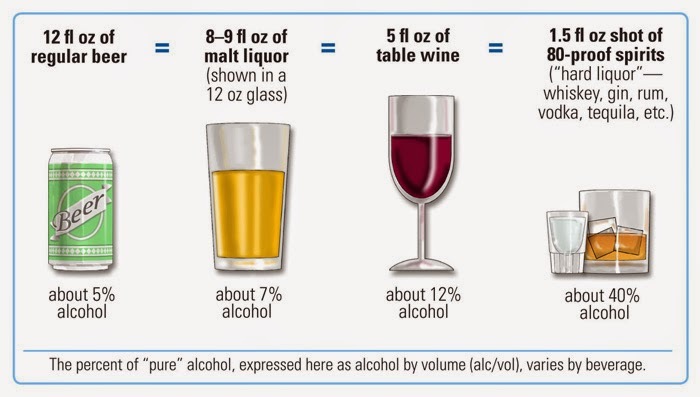 Heavy drinking was defined as 2 or more drinks per day and light drinking as less than 0.5 drinks per day. Results demonstrated that heavy drinking increased the risk of stroke by 34% in comparison to light drinking. The heavy drinkers were also more likely to have a stroke 5 years earlier than their counterparts, regardless of genetics or other factors. In addition, middle-aged heavy drinkers exhibited a risk of stroke comparable to individuals with high blood pressure and diabetes. Moreover, the study found that almost 30% of participants had suffered a stroke and by age 75, blood pressure and diabetes were regarded as the main cause of stroke. Not only does regular heavy drinking increase the risk of stroke, it also affects blood pressure and causes various health complications. * Research also shows that drinking moderate amounts of alcohol may protect healthy adults from developing coronary heart disease. The symptoms of Wernicke’s encephalopathy include mental confusion, paralysis of the nerves that move the eyes (i.e., oculomotor disturbances), and difficulty with muscle coordination. For example, patients with Wernicke’s encephalopathy may be too confused to find their way out of a room or may not even be able to walk. Approximately 80 to 90 percent of alcoholics with Wernicke’s encephalopathy also develop Korsakoff’s psychosis, a chronic and debilitating syndrome characterized by persistent learning and memory problems. Patients with Korsakoff’s psychosis are forgetful and quickly frustrated and have difficulty with walking and coordination. Although these patients have problems remembering old information (i.e., retrograde amnesia), it is their difficulty in “laying down” new information (i.e., anterograde amnesia) that is the most striking.